8' wheels in front and rear easily remove without tools. Deluxe back release. Deluxe, all aluminum rear wheel locks. Weighs only 19 lbs. 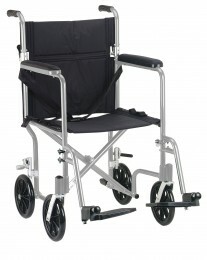 30% less than traditional transport chairs. Aluminum frame for lightweight strength and durability. Composite wheels are lightweight and maintenance free. Comes with carry pocket on back rest. Comes with swing-away footrests. Comes with seat belt for added safety. Soft, plush nylon upholstery.